The Second World War had demonstrated that the front of a vehicle was the most vulnerable section. As a result, to deflect projectiles and blasts from explosions, Panhard gave its AML light armored car its characteristic hull front. The AML is a small 4-wheeled armored vehicle for 3 people. It performs well on varied terrain, can cross ditches 80 centimetres wide and climb 60% slopes. The 90 hp, HD flat 4-cylinder engine is located at the rear. 1. 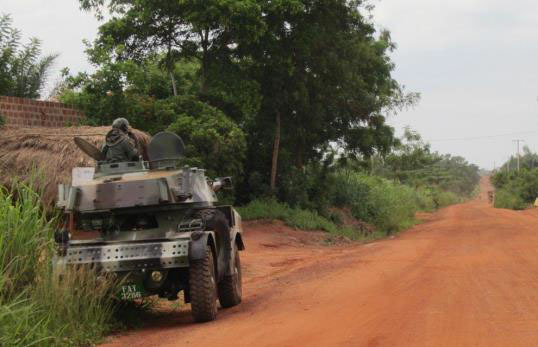 An AML 90 during an armored vehicle combat operation in Togo in 2014. The Panhard AML made its operational debut in 1961 with missions such as maintaining law and order, securing itineraries and carrying out reconnaissance operations. It is also airtransportable. The AML 60 was a mortar carrier while the AML 90 was equipped with a machine gun. Reduced orders from the French army encouraged the manufacturer to successfully turn to the export market. Orders were received from about thirty countries and 1600 Eland vehicles were built under licence in South Africa. A total of 4,000 AMLs were sold in many different versions. Withdrawn from service in France in the 1990s, the AML is still used in several African countries.